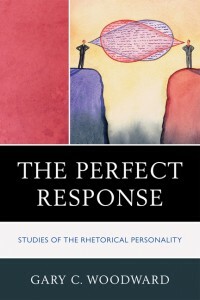 This study is an account of the social origins of fluency from a scholar recognized as “a leading analyst of the dramaturgical dimensions of politics.” In this book Gary C. Woodward creates and elucidates the idea of “The Rhetorical Personality, using a deft blend of communication theory, social history and rhetorical criticism. With unusual capacities for expressiveness, persuasiveness, and sensitivity, Rhetorical Personalities thrive in settings that call for communication that will transcend differences and engage others. They typically have a heightened sense of their own persuasive power, a skill for “reading” audiences, and the capacity to function effectively in unfamiliar settings. Each chapter of The Perfect Response probes the nature of these uniquely social persons from a different perspective: through the sympathetic characters of a prolific Hollywood filmmaker; by examining the nature of the social isolation in individuals with autism-spectrum disorders; through cross-cultural comparisons; and by assessing seminal and recent social science research on key benchmarks of rhetorical skill, such as “high self monitoring,” “other-direction,” and “the capacity for engagement with others.” Focusing on public figures that range from comedian Steve Martin to political leaders as diverse as Bill Clinton and Tony Blair, Woodward builds a detailed “conceptual map” for profiling the kinds of individuals who naturally maximize the possibilities of communication in public settings.